Horses have been one of the great loves of my life for longer than I can remember. I absorbed the details of every horse story housed at both the Kitchener and Waterloo public libraries, and for many years, adored C.W. Anderson, wanted my own Man’o War. To this day, I long to go to Chincoteague to see the wild ponies and bring my own Misty home. I spent hours pouring over bloodlines, and dreamed of breeding and owning the first filly to win the Triple Crown. I built stalls in the garage to house wooden horses, and manipulated at the hips the legs of my Barbie dolls so they would be able to sit on my “Johnny West” plastic horses. I had them all, in all colours, using white out to add additional markings. As a rider, my career started off rather sketchily. My mother, who was a dancer, was a firm believer in ballet, figure skating lessons, arts and crafts. Other than my absolute disinterest and complete lack of talent at these activities, the first inkling my parents had that things “might not be right” was a phone call from the Principal at the Bilingual School, where I was serving detention for sneaking across the two lane highway by the school to visit the mares Bonita and Bunny. The detention was the result of an escalation in crime; in truth, I had been visiting those two mares every day for an entire school year; the tipping point was my decision to climb the fence and sit on Bunny’s back. Farmers yelled, phone calls were made, and a very grim Mrs. Cook marched across the road to retrieve me. An ear may have been involved. Before this incident, my mum had significant reservations about horseback riding (“it’s so dangerous, Stan, and Suzie is so little”). The incident acted as catalyst, and after time had been served, I started riding at a very military academy run by a very strict and correct German master whose horses never deviated from the pattern. From there, my early years ran the gamut of experiences, including lessons with Kim Kirton on the mighty Mighty Mouse and then with Mary at TAWCO farms; with the small but fierce Joe Thauer, whose dutiful mares Natasha and Susie schlepped me around the ring and cross country. In my 13th year, after spending a month with a friend and her father at a rented farm where they kept Arabians, I spontaneously combusted, pulled newspaper money from the bank, and rescued my first horse, a chestnut appendix gelding named “Moose” (Cajun’s Little Injun Joe). Together Moose and I showed equitation and hunters, field hunted, evented, played polo, and did endurance. Fast forward more than a few years, and my re-entry into the horse world has been fraught with peril, adventure, and learning. 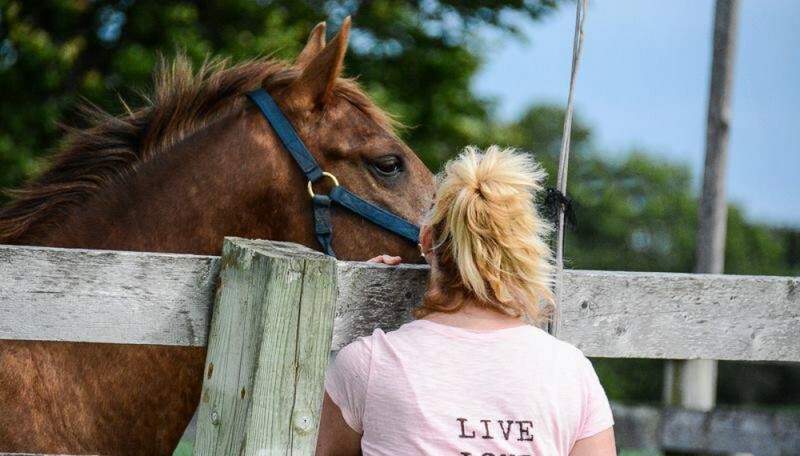 It started as a volunteer with a therapeutic riding organization, and it has taken some surprising, wonderful, and sometimes sad twists and turns. Given what I knew as a young adult, and what I know now, I have no reason to believe it will not continue to do so. Along the way, I have made some wonderful friends, learned some painful life lessons, and had some wonderful opportunities fall into my lap. The Piebald is both a compilation of stories about the horses I have loved, observations and lessons I have learned, and stories I wish to share. So why The Piebald? From Beaver to Senior at Wapomeo in Algonquin Park I rode a wonderful and talented pony named Squeeze. We partnered at camp for the duration of my time there, attending the summer hunt in July and winning the three-day event in August. Squeeze was my first heart horse. And she was a piebald.